John Frankenheimer’s (The Manchurian Candidate, Seconds) crackling 1964 action war thriller The Train finally makes its Blu-ray debut on its 50th anniversary courtesy of Twilight Time. 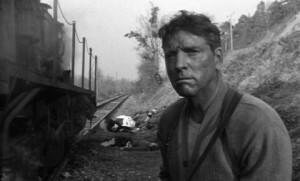 The Train stars Burt Lancaster (Sweet Smell of Success) as a workaday World War II-era French trainman charged with ensuring that a cargo of irreplaceable French art—the pride and heritage of his nation—is not allowed to leave France, despite the machinations of a Nazi officer (Paul Scofield, A Man for All Seasons) determined to steal these great works for Germany. Sounds a bit Monuments Men-ish, doesn’t it? Also starring Jeanne Moreau (La Notte) and Michel Simon (L’Atalante), and featuring compelling black-and-white cinematography by Jean Tournier and Walter Wottitz and a thrilling score by Maurice Jarre (Lawrence of Arabia), The Train remains one of the icons of Sixties cinema. The Train is now available for pre-order from distributor Screen Archives. As supplier Twilight Time prints up only 3,000 copies of each title, the time to pre-order your Blu-ray is NOW! There is a pre-order limit of three copies per customer.